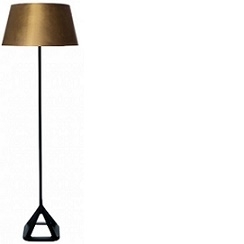 Base Floor Light by Tom Dixon is a floor lamp that combines a brushed brass shade, cast iron base. Robust and honest metalwork design is what Tom Dixon is best known for. The warm hued brass gives a soft, ambient light that‘s versatile enough to be used in a variety of spaces; from bedroom to living room. Bulb Spec. : E27 42W (max). Bulb not included. Cable Spec. : 300cm/118in black fabric cable with foot switch 100cm/39.4in from the plug.